I really like this show, which is aired here as De wet volgens Born en Glaser' (The law according to Born and Glaser) and not as Die Cleveren' (The Clever Ones'). The show is basically a variant of the American TV show Profiler which starred Robert Davi and Ally Walker. 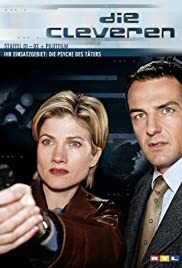 In this show we follow profiler Born (Hans Werner Meyer) and Glaser (Astrid M.Fünderich) who works for the BKA (whick is an abbreviation for Bundes Kriminal Amt which like the national police instance). As in profiler the two hunt down serial killers and psycho's and they do so with more reality based resources than the people did in Profiler. Born has got no sixth sense' as had Samantha (Ally Walker) in Profiler. The things that really kept this show running were the great, intriguing and real depictions of the cases, the hate love between Born and Glaser and the hateful/cynic meetings of Glaser with the female pathologist (Barbara M.Ahren). I really hated seeing Fünderich leaving the show to be replaced by Delia Mayer, especially after the events of the two previous episodes, but I guess I cannot do anything about it. The stories are still great, but I wonder (after two episodes) if Mayer will be as good as Fünderich, after the break of the series is over. I mean she is not a bad actress, but once a character you've grown to like disappears and is replaced you have to start adjusting to the new face. To be honest, I do not always succeed but sometimes not even the screenwriters succeed in keeping the show interesting and enjoyable. Not because the cases become less interesting, only because they just cannot replace the former character. I really think that at times a formula change is required. As for this show. I can highly recommend all episodes featuring Glaser. If there will be more, I'll have to see them before making my judgment (of course).